She professed faith in Christ and was an active member of and Sunday School treasurer for Miller’s Chapel United Methodist Church. 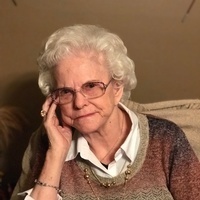 Mary was a retail sales clerk at Victors and JC Penney’s in Campbellsville, a member of the Taylor County Homemaker’s Club, and she crocheted many baby blankets, afghans and Christmas ornaments. She united in marriage to Reed Wilson March 29, 1946. He preceded her in death August 6, 2016. She is survived by two daughters and one son: Debbie Williams, Kathy Ramsey and husband, Mike and Troy Wilson and wife, Patricia of Campbellsville; four grandchildren: Kevin Lee Wilson and wife, Tammy, Deanna Gupton and husband, Todd, Michelle Tucker and husband, Frank and J. Ramsey and wife, Millie of Campbellsville; nine great-grandchildren: Allen Wilson, Alex Wilson, Brook Polston, Corey Gupton, Sydney Tucker, Joshua Tucker, Phil Durham, Frankie Tucker and Donald Tucker; seven great-great-grandchildren; one sister-in-law, Margaret Phillips of Campbellsville; several nieces and nephews and many other relatives and friends. She was also preceded in death by one son-in-law, George Williams and three brothers and three sisters: Jim Phillips, Barnes Phillips, Hugh Phillips, Elizabeth Rafferty, Lena Mae Douglas and Lucy Phillips.